My parents, my brother and his fiance visited us on the Saturday. We had a lovely day relaxing at home with tea and cake, before going for a long lunch at a local restaurant. We all enjoyed a delicious lunch, and our little one was so well behaved eating all her lunch and being happy is everyone’s company. My Mum is still raving about how well behaved she was now, she did knock a glass of water over me though. After lunch as the weather was lovely, we got to spend the rest of the afternoon outside in the sunshine. We had planned a trip to IKEA to purchase some baby-proofing essentials, and to choose a new table and chairs for our kitchen. I was fairly organised with this and had written a list of exactly what we needed. You need a list for IKEA otherwise you come home with nothing but picture frames, cushions and candles. Still with a list, we forgot to purchase the kitchen cupboard door stoppers and plug socket covers. But we did get the drinks cabinet doors we desperately needed, picture frames, glasses, mirror and rug. Our little one also had another bout of travel sickness after my husband drove too fast around a roundabout, so our trip to IKEA started with a full strip down in the toilets and my hands stinking of baby sick. Luckily now whenever we go in the car I now travel with spare clothes. On Bank Holiday Monday (the worst weather of the weekend) we had planned a trip with friends to Chartwell in Kent, which is a National Trust property. The weather wasn’t too bad, a little damp, but no rain. Chartwell is a lovely property, where William Churchill used to live, it also has extensive grounds with lawns running down to a lake. We didn’t go into the house, with the little one, but instead made use of the grounds. There are beautiful walks down to the lake in the valley and up on the woodland paths, we even managed all the paths with the buggy too. I particularly enjoyed seeing all the bluebells under the trees, they are so pretty when they look like a carpet. The restaurant at Chartwell is lovely serving home cooked food, and huge portions of cake. I enjoyed sausages and mash, whilst my husband had the beef bourguignon, we then had the biggest slice of chocolate cake that I had ever seen. More walks were required after lunch to walk off all the food. We had a lovely day at Chartwell spending time and catching up with friends from University that we hadn’t seen for a while, we decided that Chartwell was an ideal location for us all to meet us as the drive out of London was about 45 minutes for each of us. It would make an ideal place for a visit in the summer when the sun is shining, and a picnic can be consumed. I hope you enjoyed reading about my week. Sounds like a lovely bank holiday weekend! I need the IKEA baby proofing in my life- even though she can’t crawl, she rolls like a wild thing and has already (I’m a little ashamed to admit) bumped her head rolling into things. I need to go in search of bluebells! A good excuse to get out and about tomorrow I think! Sounds like a lovely week, although I have to say I hate going to places like Ikea, I am more of an online shopping person lol. haha! A trip to Ikea is essential for the long weekends lol… Sounds like you had a good week! 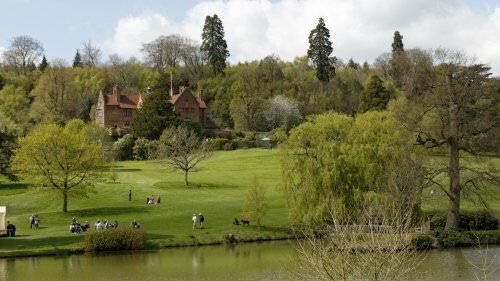 I’ve never been to Chartwell, but it looks lovely. I keep putting off a trip to IKEA even though I really want to go – I just know I’ll end up spending a fortune! Sorry to hear to little one gets car sick, it’s an awful feeling and can’t be nice at all. We are member of the National Trust so it’s good to read about properties worth visting! Also, good on you for braving IKEA! Sounds like a lovely week. We are planning an IKEA trip in the near future and we always forget bits. this will be our first trip with our little one so that will be interesting now that she is trying to walk. When I read about your hands smelling of baby sick ‘mum life’ just comes to mind haha. At least you always remember to bring spare clothes! Everywhere I go now someone tells me I either have baby poo or spew on my top and I just reply ‘I know’. Ha! It feels like I have spent my last 6 months in Ikea with the two Ikea hack makeovers we have done. Plus the extra visit due to my husband hauling a pax wardrobe upright without back panel in place –> Pax wardrobe becomes broken heap –> Ikea trip for Pax wardrobe mark 2!